UAF's Nicole Bozek had 28 points in a loss to West Liberty. Photo courtesy UAF. Congratulations to all the teams that competed in the Mt. McKinley Bank North Star Invitational last weekend, especially tournament champions, the Lenoir-Rhyne Bears from North Carolina. Many of the visiting teams chose to stay at the Fairbanks Princess Riverside Lodge for its comfort and proximity to the University of Alaska’s Fairbanks campus. The same reasons make it a great place to stay on your next trip, whether it’s to check out a university sporting event or just enjoy the Golden Heart City. For the past 10 years, the UAF women’s basketball team has hosted a four team, three-day tournament over the Thanksgiving weekend. This year, the UAF Nanooks faced the Lenoir-Rhyne Bears, the West Liberty Hilltoppers and the Western Colorado State Mountaineers at the UAF Patty Center. 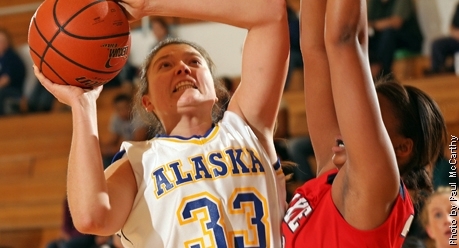 Throughout the weekend, the Nanooks furiously battled it out on their home court. Despite their efforts and home court advantage, they ended the tournament with a second place win for the second year in a row. Head coach Cody Burgess commented in an article on the UAF athletics website that there were some easily avoidable errors, but that she was satisfied overall with her team’s performance in the tournament. The UAF Nanooks women’s basketball team will be back at it at the Patty Center, Saturday night Dec. 3, going up against in-state rival, the University of Alaska Anchorage Seawolves.